The Bed & Breakfast "Le Risaie", thanks to its position is the ideal starting point for excursion to Venice (30Km), Padua ( 25 km ), Treviso (17Km), Asolo (30Km), Castelfranco Veneto and its walls ( 15 Km ). It's also very interesting to visit the nearby Venetians villas, which are in Trebaseleghe (Villa Scarpi) as well as in the surrounding such area as "Villa Cornaro" (Arch. Andrea Palladio), "Villa Marcello"(dated 1700) and "Villa Emo". This villas are also easily reachable through by bicycle tracks ,which allow you to stroll around the Venetian territory, enjoying both nature and art. One of these tracks takes you also to the "Cervara's Oasy", a natural Park where to enjoy the river Sile's spring and all the nature around it. the guests will be hosted in an old manor, which has been recently restored. In the 19th century it was used to store rice, while at the beginning of 1900 it was transformed to a cereal deposit. Staying here is ideal for whom is seeking quiet and for whom likes to walk around the fields and along the river Dese's banks, where there are old watermill to testify the old rural economy of this area. At the guest complete disposal there are also a kitchen and dinning room, very useful in case of new year's Eve parties or special events. In the area several are the typical restaurants which offer specialities of the Venetian food such as white corn bread , lagoon fish, red chicory and the asparagus. The manor is surrounded by a beautiful garden where kids can play and run under the discrete control of whom rather relax under a magnolia tree or sun then thanks to the hot summer rays. No experiences yet with Le Risaie. Be the first! Did you stay in Le Risaie? Let us know what you thought about it and help others to make the right choice! * I confirm having stayed in Le Risaie. 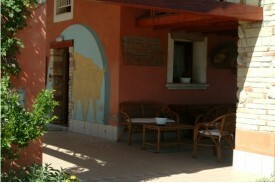 Find other bed & breakfasts in Padua or all bed & breakfasts in Veneto (Venice).